We shall be on holiday in France from the weekend and then relying on dial-up for a while so I'm going to try and post all my fo pictures before we go. In fact I signed up for French broadband today!! It can take up to two weeks after they've received the db form that will be waiting for me to complete when we get to France. I hope it all works smoothly because the internet on dial-up was just too tedious. Before the pictures I must share the good news of the arrival of the latest family member. Fearne Natalia was born on Monday July 7th, 7lbs 1oz. DD3's third child - she's got two girls and a boy- and my seventh (7th) grandchild!! I've got five g-sons but only two g-daughters. Two more g-sons expected later this year. 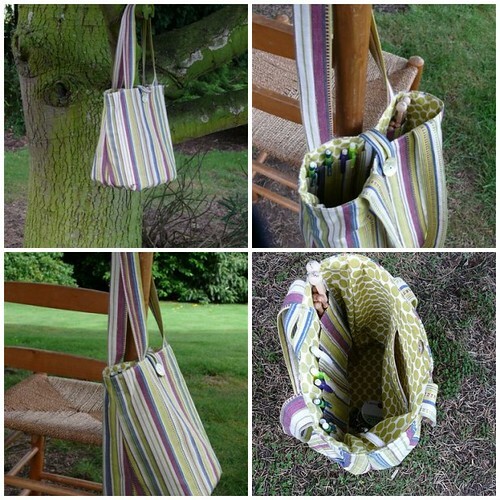 Tote bag for carrying a knitting project and everything else. 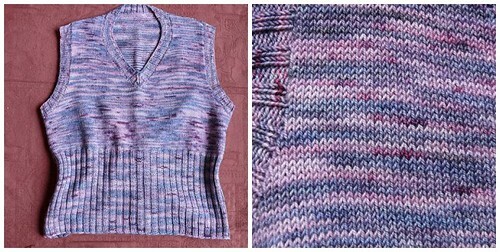 Colinette's Jitterbug in colour Mist on 3.25mm. I made the longer sleeved version. Lorna's Laces Shepherd Sock, colour "Seaside"and my usual toe-up magic loop on 2.5mm circular using Violet Green's Tapestry Sock pattern. 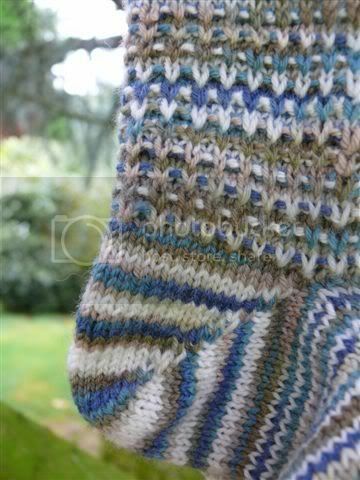 I don't usually knit patterned socks but I really like the way the pattern mixes the colours so it actually does have a tapestry-ness about it.e very much. 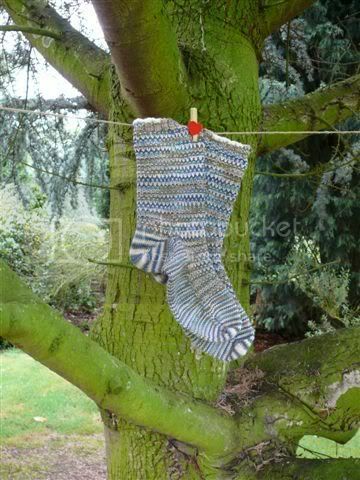 And I love Shepherd Sock! 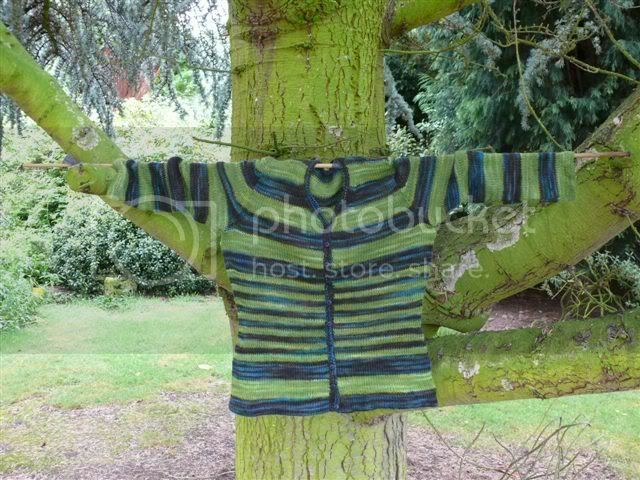 Fleece Artist BFL 2/8 Sea Storm as used in the pattern picture with Suri Blue (also Fleece Artist) colour Moss. And although this time I did a size that should have fitted me without negative ease and yes my tension was spot on, why do I still feel when I wear it (= try it on - I've not actually worn it yet) that it's not quite big enough.... Well, the shoulder seams don't reallly sit on my tops of shoulder so that's why. But if you look carefully on thepattern photo neither does the one on the model. So I'm probably not going to make another from that pattern.....and I probably shan't wear either of the ones I've so far made. Disappointing. But I love the feel of it. 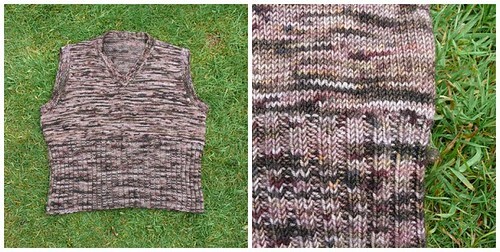 I like jumpers made in sock wool or finer so just maybe I'll make a sort of combination of Tempest and Marguerite. Then I'll know it will fit. Wow, some gorgeous FOs there. Especialy love the bag, are you taking orders for those? 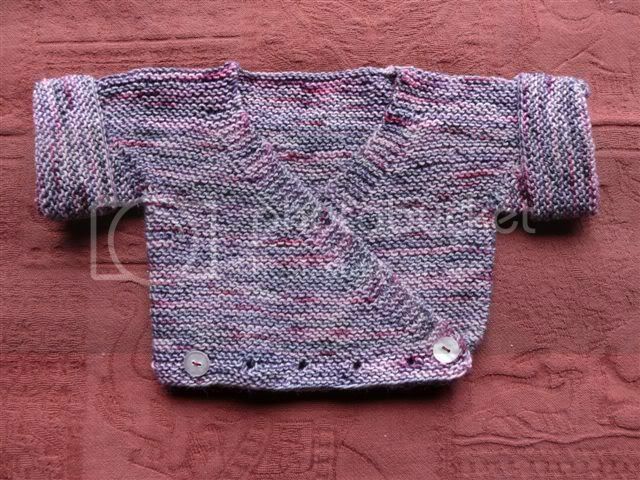 All the knits are gorgeous too, and what a cute little baby jacket. What a great bag Kathryn. Love the bag, I'm sure it will get loads of use. Congratulations on being a Granny again too. 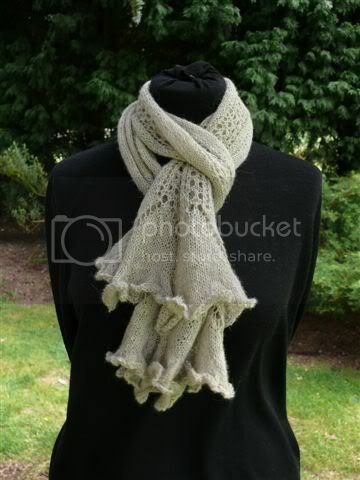 Love, love, love your Flutter scarf! So pretty! 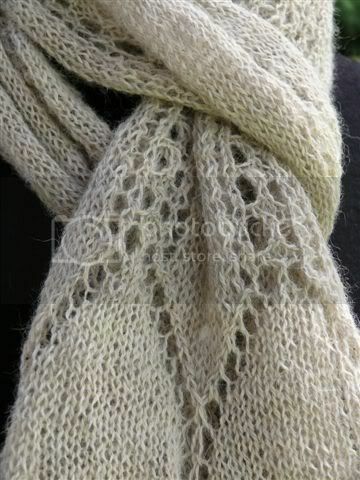 Oooh - the Flutter scarf is definitely being bookmarked. I like the look of the Tapestry Socks too! The tote bag is lovely. Grogeous fabrics and beautifully put together. OMG - your projects are all so gorgeous.. when do you have time?? I especially like the tote and the flutter scarf. What a lot of lovely things! Inspired by your last flutter scarf I am halfway through my first - I am in awe of your productivity. Congratulations on your newest grandaughter! Hope you are all enjoying the French countryside and the baby dormice are hanging in there.